Rain, snow and inclement weather is no excuse anymore! With the Bike Lane Pro Trainer by Bike Lane Products stay riding anytime you want, all year round. Train safely, away from high traffic areas. The easy change resistance controller allows you to choose your training with up to 5 levels of resistance. The wide base design gives extra stability and a smooth, quiet ride. For the beginner to the training professional, this product is perfect for year round fitness. As soon as you begin to pedal, the strong internal magnet creates resistance. The Bike Lane Trainer is extremely light. and it can folded for travel and storage. The Bike Lane Trainer features extra wide legs and a sturdy frame makes this the trainer the pros choose. The Bike Lane Trainer features the finest materials and proven reliability. We stand behind every product we sell and back it up with a 100% satisfaction guarantee. Adjustable foot pads for uneven flooring. 5 powerful magnetic resistance levels simulate road conditions. Includes a machined steel flywheel for the most natural pedal feel. Fits 700c or 27 in. (Road) or 26 in. (Mountain) wheels with different tire sizes. Dimensions: 15.75" x 18.5" x 21.5"
►STATE OF THE ART - As soon as you begin to pedal, the ultra QUIET internal magnet creates resistance. You can easily increase the resistance by shifting the gears on your bike! 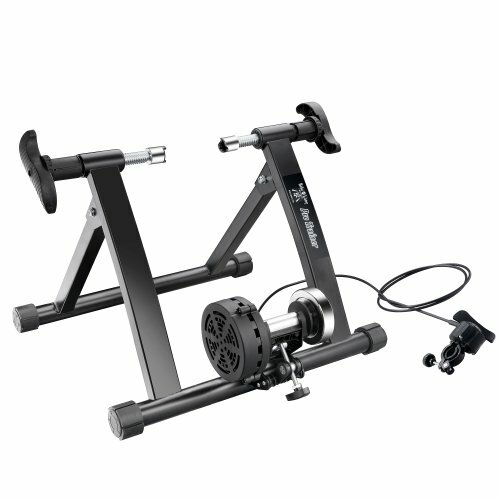 ►VERSATILITY - Turn your bike into an indoor exercise bike, easy set-up and quiet operation, riser block included.